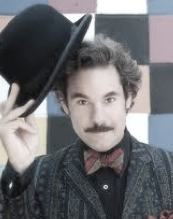 paul f. tompkins is a very funny, very natty fellow. paul dresses more nicely than you. in fact, he dresses more nicely than 99 percent of americans (but strangely, only 39 percent of nordic peoples, who are very fancy). best known for his extraordinarily smart, personal standup material and extended, wide-ranging, mind-blowing live comedy riffs, paul has been charging the edges of the comedy art form for most of his career. from mr. show with bob and david to tenacious d to comedy death ray to the long-running best week ever to his popular “radioplay” podcast the pod f. tompkast, paul delivers smart comedy that makes you laugh uproariously while also making you feel extra-super smart. and better than other people. all while wearing the kind of clothing that indicates he may tell time with a pocket watch, use a lion-headed walking stick, and pay his restaurant bills in krugerrands (or at least limited edition U.S. mint commemorative coins). settle in with paul and aisha as they discuss why the skinny tie is the first sign of the end of civilization, media promiscuity, the bewildering math of lingerie, and the importance of having friends smarter than you. plus, why wedding drinking is both the best and the worst kind of drinking, and aisha insults santa claus. c’mon. santa’s outfit could use an update.